Elegant roofing solution. Virtually unbreakable 8mm multiwall polycarbonate roof panels are high impact and shatter resistant. Maintain their integrity, provide complete UV blockage and are 100% UV protected. They do not discolor, fracture or become brittle over time. Safe, quick and easy DIY assembly - sliding panels installation system, pre-drilled profiles, pre-cut panels, all securing hardware included. Wall mounting plate is adjustable to meet your needs. Flexible poles positioning sideways. Durable structure - corrosion resistand, powder coated aluminum profiles and galvanized steel connectors. Sturdy aluminum poles. 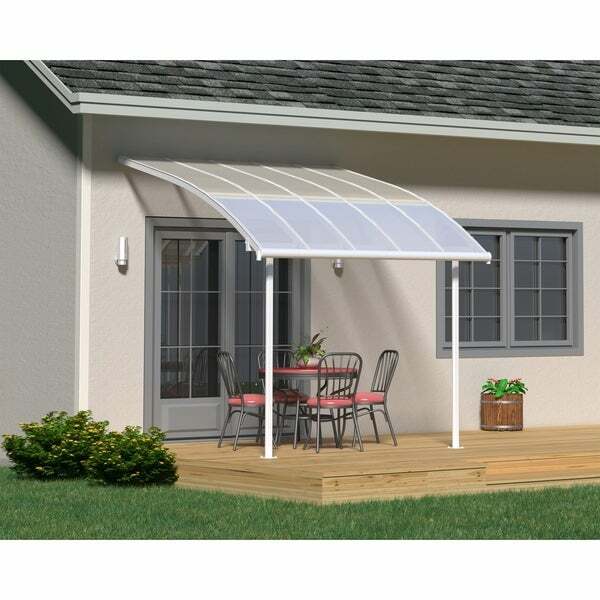 Anchoring and foot-pads included - Secure the patio cover to the surface of your choosing. Built-in gutter and adjustble gutter heads allow you to easily channel and collect rainwater. Maintenance free - no rust, rot or peel. Adjustable height from 112.2" to 130.3" high. Dimensions 290.9 In. X 116.1 In. X 112.2 In. "Will it fit a deck that is less than 10' out? Are the posts heights adjustable? Our deck is 9' x 25' and has two levels with two steps. Thank you!" "Snow load it will hold?" This will hold approximately 30.7 pounds per square foot.